Silk Road Reporters: An Independent News Site for Central Asia? Why a new site covering Central Asia might not be all that it seems. For those unfamiliar with Kazakhstan, the plea may have proven persuasive – a nascent nation, with a new perspective, from a part of the world often overlooked. And for those unfamiliar with English-language media covering Central Asia, Silk Road Reporters may have appeared as simply another media outlet for a long-neglected region. On digging a bit deeper, however, and a number of questions emerge about Silk Road Reporters – which bills itself as an “independent news website” and is one of the few English-language outfits focusing on Central Asia. Questions about its “contributors” and their lack of track record, or indeed any kind of record. Questions about connections to consultants and PR specialists, and links to those lobbying on behalf of the Kazakhstan government. 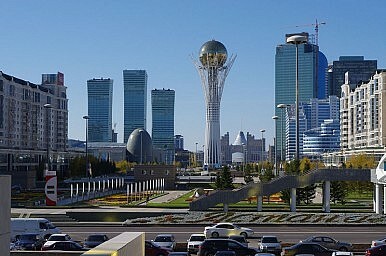 While no paperwork linking Silk Road Reporters to Astana has emerged, numerous signs surrounding the publication point to the outlet as yet another effort at Astana’s image-burnishing efforts in the United States – an effort that has not only roped in Tony Blair, but has already extended to assorted American media outlets. Silk Road Reporters, which first began publishing stories on the region last January, says it offers “compelling original reporting, analysis, interviews, and investigations from Central Asia[. ]” The publication is run by James Kimer, the site’s self-described “owner and editor.” In an interview, Kimer said that he had visited Central Asia multiple times over the past decade, and wanted to give a voice to those in the region “who had almost no coverage in English-language media.” With his own money and an “inheritance” from his grandmother, Kimer began Silk Road Reporters in early 2014, and has been publishing regularly ever since. However, Silk Road Reporters is not Kimer’s main focus. He also runs K Social Media Consulting, a Washington-based PR firm that claims to stand as a “new breed of public relations” agency. Kimer’s work in communications and spin has previously extended to Central Asia – including work with the law firm that represented Mina Corp., the fuel company accused of providing kickbacks to the autocratic Bakiyev family that was toppled in Kyrgyzstan’s 2010 revolution. Soon after this reporter requested contact information for these writers from Kimer, their names were scrubbed from Silk Road Reporters’s “About Us” page, though they remain available via archive. Likewise, shortly after the interview with Kimer, Silk Road Reporters added a disclaimer that original analyses “may or may not reflect the [publication’s] editorial position,” and that certain writers “may require the use of pen names[. ]” One of the employees requiring a pen name, according to Kimer, is “Joe Peerson.” According to information scrubbed from the site after the interview with Kimer, “Peerson” is an American editor based in Astana whose sole task is “collecting aggregated news coverage” on the region. Kimer told this reporter that “Peerson” could only be contacted through Kimer, but why Peerson – an American tasked only with collating regional news – required a pen name, Kimer would not say. To be fair, after the interview with Kimer, certain stories moved beyond brushing Kazakhstan’s image, including one focusing on Kazakhstan’s human rights issues. Unfortunately, the author of the story, Kseniya Bondal, is best-known for her work with a propaganda site run by U.S. Central Command. No direct link has appeared between Silk Road Reporters and Astana. All that exists is an “independent” publication with a distinct string of pro-Kazakhstani articles, run by a professional consultant who is listed as one of two media relations counsels for the man charged with leading Kazakhstan’s media engagement in the U.S. – and stocked with “contributors” who have been scrubbed from the site, whose contact information has been repeatedly withheld, and whose prior publications seem nonexistent. Kazakhstan already has a notable history of media manipulation in the West, and considering the product and slant of Silk Road Reporters, Kimer’s consultancy firm may well not be his only project focusing on a new breed of public relations. Nurbots fill comment sections across the Kazakh internet. They may not be convincing but they pollute online discourse.